Delving into Johnny Cash's back catalogue can be a daunting prospect, since there's so much material that it's hard to know where to start. 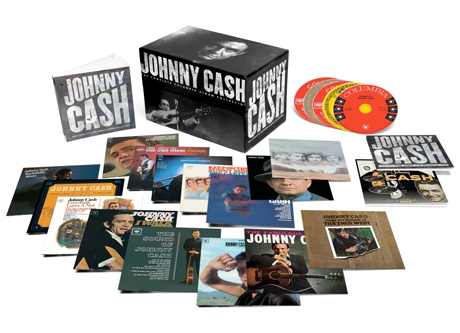 If you were looking to pick up a massive amount of the Man in Black's music in one fell swoop, then you'll be pleased to know that Columbia/Legacy will be releasing Johnny Cash - The Complete Columbia Album Collection on October 30. This box set will include 59 albums, plus some bonus compilations, making for a total of 63 discs. These will be housed in a box with a lift-off cover and detailed liner notes. Each CD is packaged as a mini-LP, with the original artwork preserved. The earliest album included here is 1958's The Fabulous Johnny Cash; the latest is 1990's Highwayman 2, which was recorded with Cash's country supergroup the Highwaymen (featuring Willie Nelson, Waylon Jennings and Kris Kristofferson). The other albums include many of Cash's classic full-lengths, plus live albums, soundtracks and rare titles. They cover a wide range of styles, sounds and producers, and for 35 of the titles, this is their first release on CD through Columbia/Legacy. As for those two bonus compilations, one is called Johnny Cash with His Hot & Blue Guitar, a 28-track compilation of material recorded during Cash's Sun Records years from 1954 to 1958. The other compilation is a double-CD collection called The Singles, Plus, which includes singles and B-sides that do not appear elsewhere, plus guest Cash appearances on other artists' songs. This box follows a few months behind the gospel-themed collection Bootleg Vol. IV: The Soul of Truth. Go to Amazon to see a full list of all of the albums included in the box set and pre-order the box.